Well whether you are ready or not for fall, it's here. The rain, knit blankets, thick sweaters, cozy fireplaces, and apple recipes. 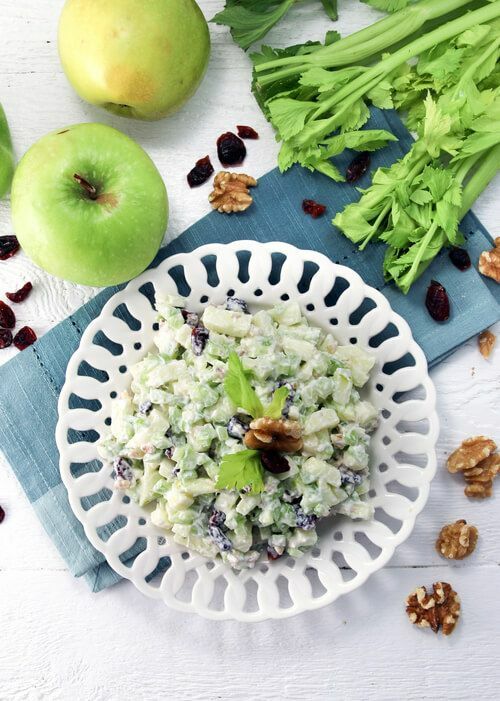 This apple salad with celery is a great snack to use up your apples. I have been planning to make it for a few weeks now, and finally got around to it. The saying goes that ‘an apple a day keeps the doctor away’ but how? What kind of health benefits do apples contain? This high fiber fruit is a miracle detoxifier for your body! Apples help memory, so one a day is a good idea. Besides that, apples contains nutrients like vitamin C that hydrate and benefit healthy skin! But apples are not the only nutritious ingredient in this salad. Celery is filled with fiber and cranberries contain proanthocyanidins which prevent a number of diseases. Peel 1 apple, chop apple, leaving the core out. Chop 2 celery stalks, and 1/8 cup walnuts. Mix chopped ingredients with 1 1/2 Tablespoon dried cranberries, 2 tablespoons organic plain Greek yogurt, and 1 teaspoon lemon juice.